After my 2 weeks in England, my friend Clarice and I set off on our 1-month jaunt around Europe. 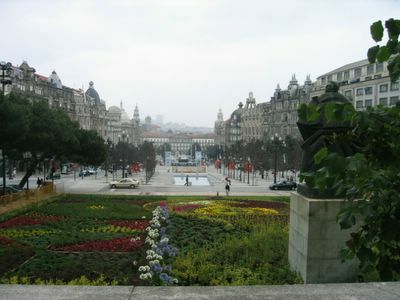 The first stop was Porto, a port town (oh, really?) in the north of Portugal. Portugal is, in general, famous for fabulous sweets and pastries, whilst Porto itself is the home of port (AKA fortified wine). It’s a gorgeous town. The buildings are stunning, with many hiding deceptively trendy shops (think WESC, Skunkfunk etc. ), the people are friendly, and the weather was fabulous. I’m told that if you head down to the port itself, there are many different port wine companies where you can do tastings. 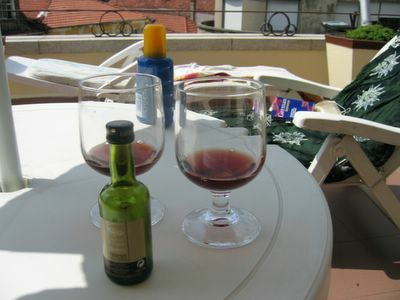 We didn’t have the time to do this though, so we just downed one of the mini-bar bottles as we were sunbathing on the terrace of our hotel. Only €3.50. €3.50 sounded really cheap for a mini-bar bottle of port, until we hit the supermarkets later on. All booze in Porto is really cheap! You can get full-sized bottles of wine, spirits, port etc. for €5 - 20. Definitely stock up if you can. One thing I love doing when I'm overseas is visiting local supermarkets. I stocked up on pudding mixes, as I know my dad loves this sort of thing. Pudding mixes - Haha, "Flan Chino El Mandarin". 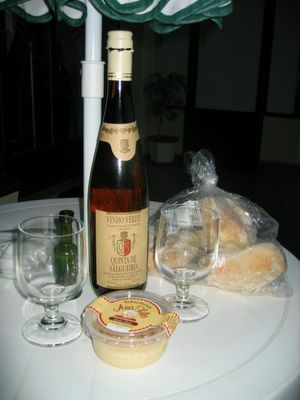 We also got a bottle of local Vinho Verde (white wine which has a shorter fermentation process than ordinary wine, resulting in a "greener", fresher taste), a tub of rice pudding, and a bag of bread rolls. We visited the supermarket at about 5:00pm, and the bread rolls were freshly baked and still warm! And that's just the beginning of our Portuguese culinary adventure! Stay tuned. What an interesting place to visit! Can I ask why Porto (and indeed Portugal) was somewhere you chose? Do you have a connection there? 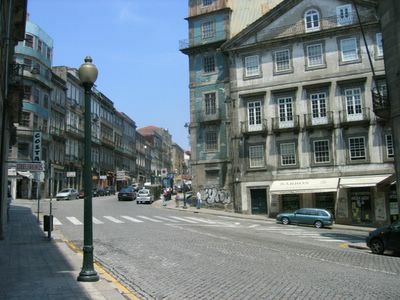 I've always wanted to go to Portugal simply because my dad's always wanted to go there. Dad has often told us the story of his well-travelled best friend sending him a postcard from Portugal while he was "stuck in boring Penang". So I wanted to send my dad a Portuguese postcard too! 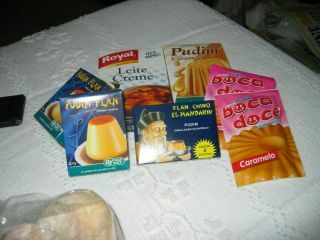 My travel buddy Clarice, had been to Portugal before, and knew that they made amazing desserts. Being Brazilian, she speaks Portuguese, which made things really easy for us too! ps Italian posts will be coming in the next few days! I'm sure you'll love the country!